We made it to the border in the afternoon, trying our best to avoid a night in Silliguri again. The Indian border guards showed us into a dark room, cooled with fans and with a chair each to sit on. A lady brought us chai and we chatted about our trip so far as they filled out carnet details in a huge ledger. Writing each letter slowly and neatly it took some time to finish the process for three bikes (we were travelling with Ra, our Singaporean friend we’d crossed Myanmar with). He had the good humour to harry the guards a little in the hope of getting out sooner! Shooing away inquisitive kids who were playing with a puppy and trying to combine the play with the bikes somehow, we readied ourselves for the next border. 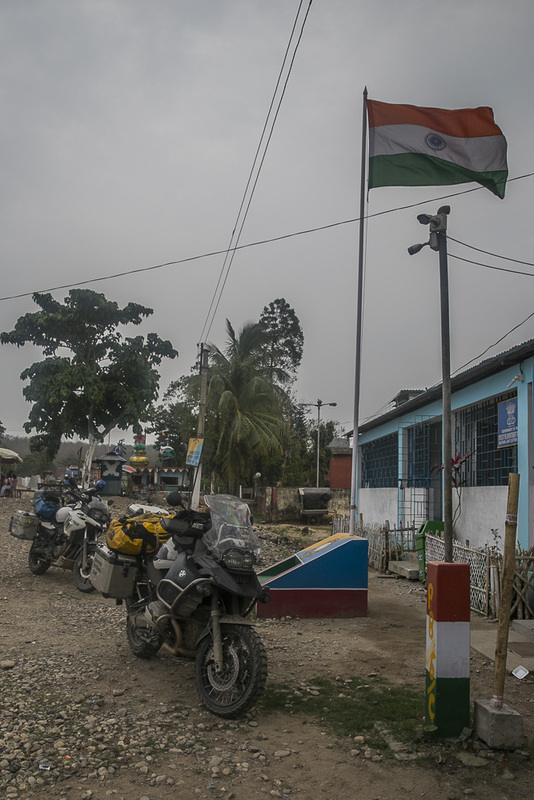 Full of chai and cooled down from the fans, we rode the short way across to Nepal coming to an empty border office. Checking in was easy and once we convinced the officials to chat to us instead of sittimg around smoking and laughing, our carnets were stamped and we were off! The main highway runs along the south of the country, east to west, linking small towns together on the way. We rode until the first big town to improve our chance of finding a hotel. Without much luck, we ended up asking a guy on a scooter who kindly rode ahead of us until we found the only hotel in town with parking! This hotel was brand new (still under construction) and work even continued late into the night. Serenaded to sleep with the sound of drills and hammers, we negotiated a free breakfast in exchange for the discomfort. 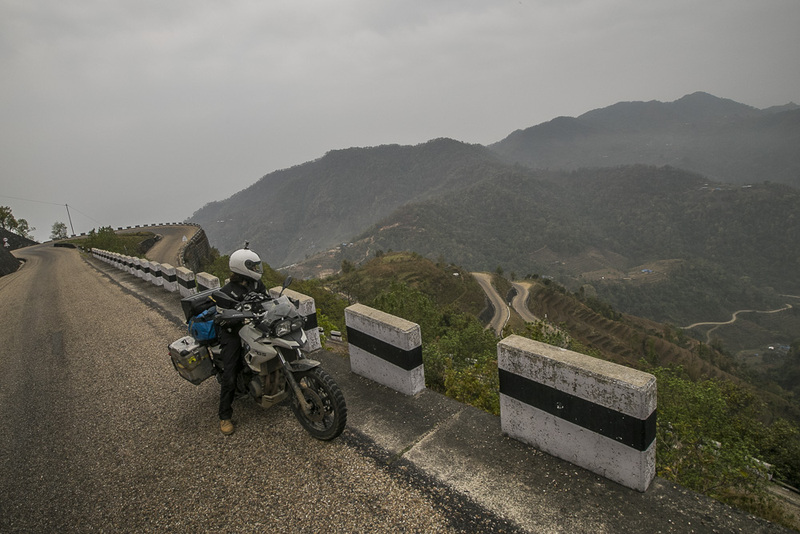 Nepalese roads were proving to be so much better than India, riding was easy and the other drivers were far more courteous, waiting for a safe opportunity to overtake and hardly ever blaring horns. It was a very positive beginning to the country. Our adventure continued along the main highway and we kept going until we had to turn right to Kathmandu. The road had been straight and flat so far and suddenly, after turning right, we found ourselves in hilly terrain, the road winding around red-earthed banks and curious skinny trees. It was a total change from the farmland and agricultural scenery of the highway and reminded us of the hills in Myanmar. We reached a tiny village where the highest building was a 4 storey hotel off the road, offering, in the middle of nowhere, wifi and secure parking! We stopped there for the night and walked into the village in search of a cold beer, only to be stalked by the village drunk who kept walking alongside Simon, his conversation swinging between demands for money to what we were doing in Nepal. The villagers were laughing at us trying to shake him off, put off by his insistence, we turned back, abandoning our walk and were then rescued by a young man who shooed the drunk away and hid us in his cousin’s bar, which happened to have beer! Dizzy at the top of the switchbacks- is it over yet? The following day brought the long road to Kathmandu through the mountains. As soon as we left the village of Bihman, we were on a series of switchbacks which marched up the mountains with relentless constancy. There were no other vehicles thanks to our 5:30am departure so the road was fun to get dizzy on. Once through the next valley, we climbed again another set of mountains towards Kathmandu. A quick break of river fish, noodles and momos (dumplings filled with chicken, buffalo or veg) re-energised us for the last push. Although Simon still needed a nap and found a convenient bench to sleep on. Luckily he managed to not roll over in his sleep as it was a long way down to the bottom of the mountain! The nap spot was a shack on the side of the road, with a homemade electricity hookup to the only pylon line across the mountain. A whole family of four generations stared at us when we arrived and bought some red bull. Silence settled across the shack but once Simon fell asleep and we walked away to rest, the conversation swelled back, the family clearly happy we were not a threat! One of the fantastic bridges and a taste of things to come! The road was very good quality, free of potholes and smooth for the entirety of the journey. 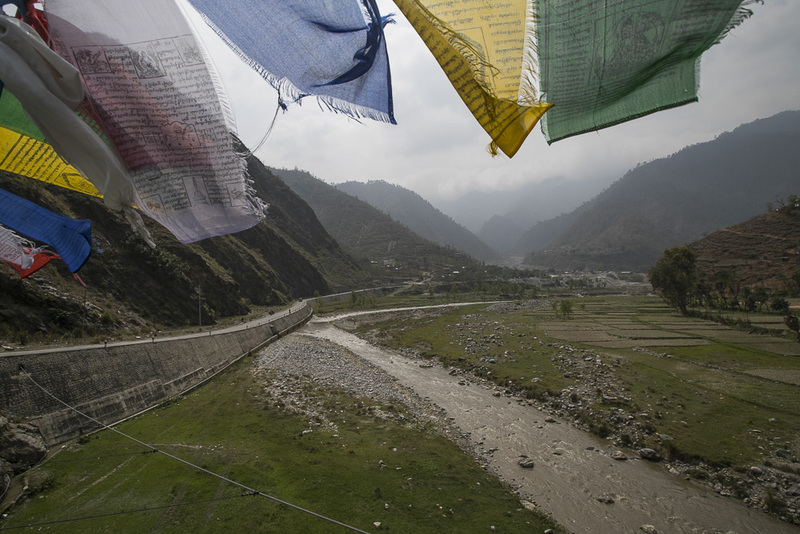 We passed huge steel suspension footbridges across the valley’s muddy river, linking the main highway to small villages otherwise totally isolated from road access. The bridge jumped and twisted with pedestrian footfall but it was quite amazing to walk across and see through the floor to the rocks and river below. The traffic started building up and the occasional speeding car would race past but the worst by far were the minibuses who would scream past us, almost riding on two wheels when swinging around corners. 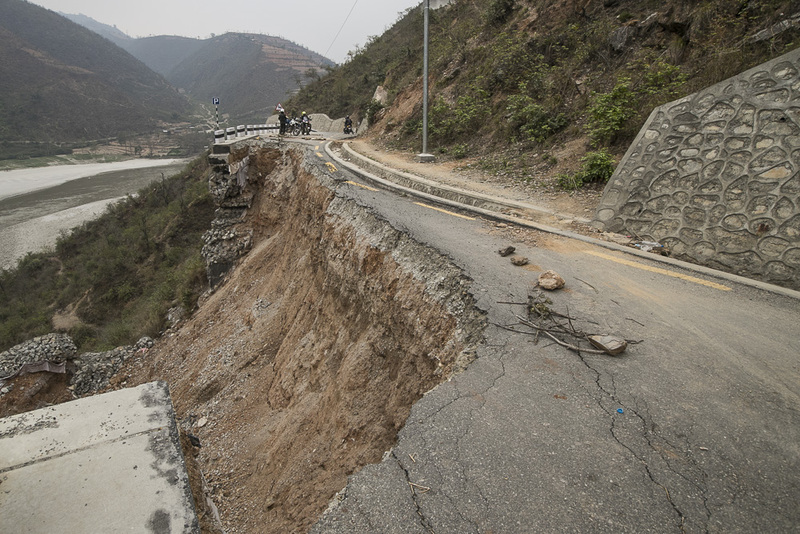 It became pretty obvious what he meant by “No road” when 20m of road had collapsed into the valley, the victim of earthquake and landslide. The Japanese constructed road had pretty solid retaining walls to keep the road shored up along the mountainside but the whole reinforced section had fallen away, with the road following soon after- a sorry pile of rocks at the bottom. Luckily for bikers, there was a tiny bank beyond the drainage ditch which allowed us to pass. An enterprising biker had shored up the drainage system with a small bridge of rocks and tamped sand. Further on, a landslide had totally blocked the road and created a mini mountain to launch over. After the drama of missing roads and two more landslides, we reached good road again, a long queue of buses and trucks had built up on the other side, clearly unable to pass. These were using the old dirt path which ran along the crest of the mountain but because the road was one way only, they were waiting for their turn patiently. Finally we hit traffic on the outskirts of Kathmandu and worked our way through the bossy trucks and buses, and the hordes of scooters weaving between us. The bikes were the worst, no lane discipline and weaving so close to our bikes, we weren’t surprised to see a couple of minor collisions between swerving scooters. Finally we hit the city and the real traffic. Huge four lane roads ran into complex 6 entry junctions with a lone policeman in the middle directing the traffic. With India fresh in our memories, we assumed everyone would ignore him but to our amazement, all the bikes lined up carefully waiting their turn to go. Simon was even reprimanded for being slightly positioned in the left turn lane when intending to go straight by a fellow biker. It was so absurdly organised after India we laughed out loud at the guy’s seriousness. Finally we made it to our host’s apartment, both pretty tired after a long day in the mountains and covered in dust from the city (Kathmandu is the dustiest city we’ve ever been to by far). Glad for a rest, we used a few days to get prepared for our Himalayan adventure.